Last night I attended the book signing of Dr George Blue Spruce Jr (Laguna Pueblo / Ohkay Owingeh) and was very delighted to meet him for the very first time. The room was full of family, friends, & most of all future medical students. Roughly about 100 people were in the room to hear Dr Blue Spruce Jr talk about his life story. 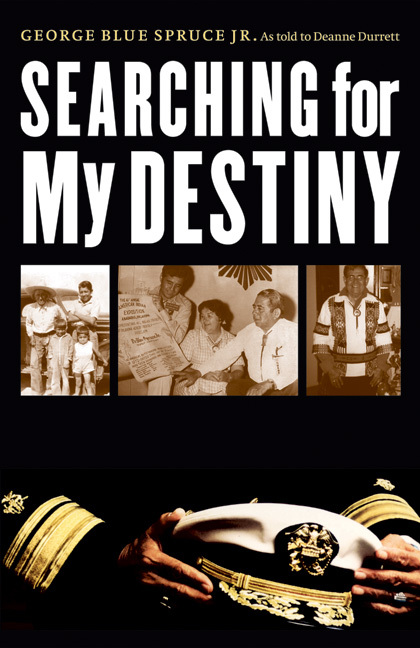 A story he finally wrote down into a book titled “Searching For My Destiny”. I have a previous post on my blog here, which contain some of what I was able to find on the internet about him. I particularly enjoyed his jokes and how he overcame adversity being the only American Indian among many groups growing up. What struck me most was how Dr Blue Spruce Jr had to develop the independence and sense of self worth to continue alone for many years away from his tribal home. His life dedication and thoughtfulness of others helped craft Indian health policy to benefit not only the tribes he was from but those of so many others as well. I am proud to have met this man, and I sincerely hope to continue the conversation again. Dr Blue Spruce Jr and the family allowed me to video the event and share it. Here is the full MP3 audio & download link from his talk (almost 43 minutes long, and 20MB in size), and a highlight video. Enjoy!